Je trouve aussi la version 7,62x54R la plus pratique pour nous autres depuis la nouvelle législation. Cet après-midi, mon binôme de tir m'a montré des étuis de 8,15x58R (ou un truc improbable du même genre) qui ont l'air bien adaptés. avec des étuis 45x70, pas de soucis . Essais dimanche prochain ( ogives plombs 323 et A0 ). Je vais demander au quelques étuis Horneber histoire de tirer quelques " pleines charges " ..!! bon,il semblerai que la chance me poursuit! je crois que je ne le verrai jamais. j'envois un mail a CH4D et je vais voir pour declencher un litige avec paypal si pas de possibilitées de m'en faire envoyer un autre par cette societe. j'ai juste une question,vos colis en provenance de CH4D vous on été délivrés contre signature ? car il semble que mon colis est sans suivi de la poste,donc pas en recommandé. Pour le fire-forming j'ai perdu ainsi quelques étuis (1/10)....Mais tous ceux que j'ai utilisé avaient déjà servi plusieurs fois ! bon,ben j vais encore attendre un peu alors. Pour ma part je viens de tirer le dernier lot que j'avais chargé à 1g de A0 et qui était donc prêt à être "fire-formés" : Tout c'est bien passé. 24 douilles finies à la cote.....Que je viens de recharger à nouveau à l'instant. tackdriver a écrit: Pour le RB dans ce calibre, tout ce que j'ai pu trouver sur le net provient de chez Norma. Je leur ai donc envoyé une demande quant aux composants employés: vivacité de la poudre, diamètre de la balle, masse de cette dernière etc.... Je suis en attente de leur réponse qui ne saurait tarder. j'ai trouvé ça chez les ricains, je te laisse le soin de traduire en français, mon niveau me permet de comprendre mais pas de faire une trad correct. First off, I don't think I know everything about rolling block rifles. I also don't think I know everything about the 8x58R Danish cartridge, known in Sweden as the 8x58RD. But I do know alot about the 1889 Swedish rolling block that fires the 8x58RD cartridge. 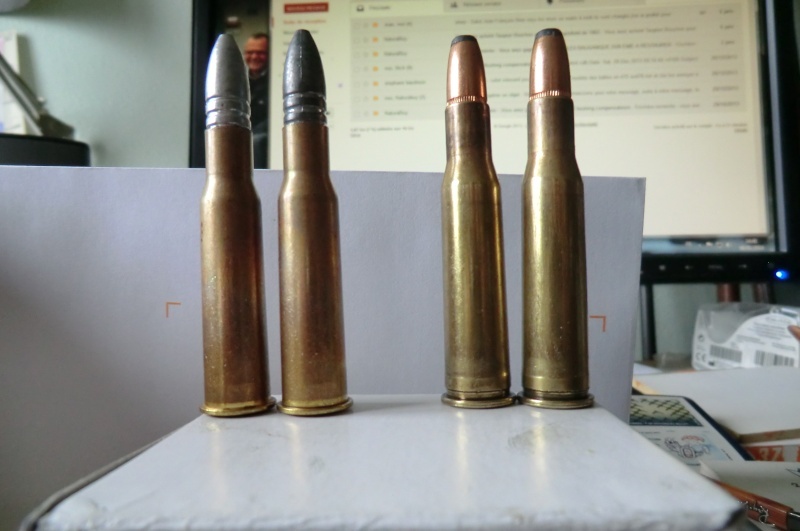 In this application of the 8x58R Danish cartridge I've seen big trouble with handloading information, so much so that I wrote to Norma Precision in Sweden and asked for help. Norma Precision knows more about the 1889 Swedish rolling block and its application of the 8x58RD cartridge than anybody, anywhere in the entire world. What information I disseminate here comes from NP in Sweden. What prompted this concern was an article in Shotgun News on handloading the 8x58RD for the 1889 Swedish rolling block. It left my mouth agape in abject fright at what it was presenting. It may take years to hear of the rifles coming apart and the people being hurt or killed as a result of unresearched load data. I lost sleep over this irresponsible act of publishing such dangerous load data. I had some private discussion with other handloaders who I know and who I know to be very experienced and who's opinion I trusted. There was no one who wasn't as angry and concerned as I was. During the research there was an incident in Sweden. An accident. A death. It concerned a 1867 rolling block that came apart. The breechblock split in two and lodged in the eye socket.... behind the eye socket.. of the shooter. It took a couple/three days for him to die. We have photos of the rifle that came with the permission of the Swedish national forensic laboratory to share in the interest of spreading information and caution on the subject of rolling block safety. Cartridges of the World by Barnes has bad data on the 8x58R Danish cartridge. COTW shows load data for 8x58RD with nothing to back it up. It states no application for the load data. It would seem to the reader that if it's 8x58RD then its A-ok for anything chambered in 8x58RD. Commission Internationale Permanente pour l'Epreuve des Armes à Feu Portatives, C.I.P. for short, is the European equivalent to our SAAMI, Sporting Arms and Ammunition Manufacturers' Institute. 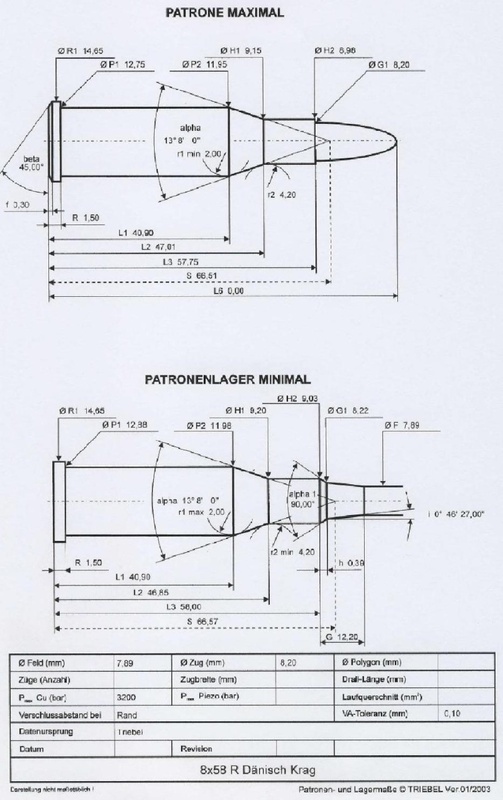 As with SAAMI, CIP puts out cartridge drawings with some basic information on that particular cartridge. Norma in Sweden sent me their CIP drawing along with a couple other PDF files. See below for the cartridge drawing sent to me by Norma of Sweden and pay attention to the maximum average chamber pressure: 3200 BAR. At sea level 3200 BAR is 46,412 psi. Think about 46,412 psi in a rolling block built between 1867 and roughly 1876 and re-case hardened in roughly 1891 to 1896. This is about the maximum average chamber pressure for the small ring Mauser like the 1896 Swedish Mauser in 6.5x55. This is an insane amount of pressure to expect from a 130 year old rolling block action. 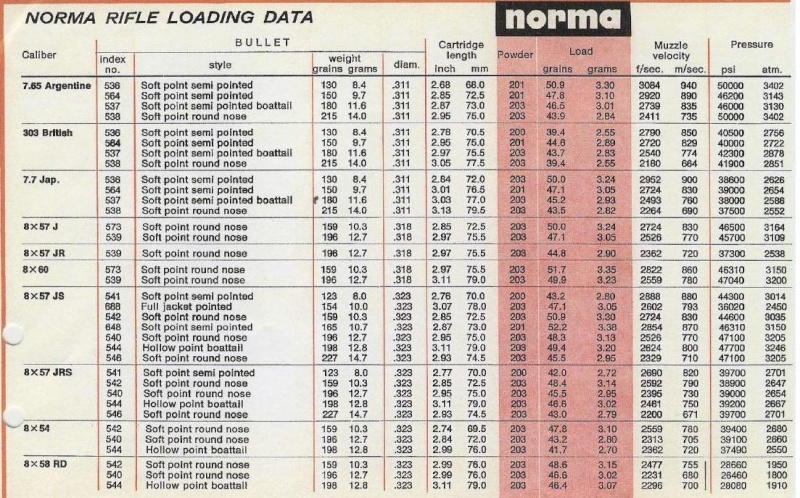 The Norma load data below is from an older 1960s-70s era factory manual. Norma sent this to me. You'll notice down at the bottom, the 8x58RD data. In the far right columns are the pressures listed in both PSI and "atm" meaning atmospheres... BAR. See the numbers? The highest is 1950 BAR. Now go back and look at the CIP maximum average chamber pressure of 3200 BAR. The psi of 1950 BAR is 28,282. Do you see how nicely that agrees with the Norma loading data? The 3rd image below is from the highly respected Norwegian Ladeboken (Load Book). but no further clues to whether sporterized or original. Barrel length - 85 cm / 33"
COTW says the Norma factory ammo with the 159 grain bullet is 2,870 fps and for the 196 grain is 2,630 fps. have included loading data for it. (velocity) of about 485 meters/second (1,591 feet per second). (2,034 feet per second) using the same bullet. the velocity was a claimed 750 m/s (2,460 feet per second). using the Dane bullet was developed for these rifles. but new boxer primed cases are available from Bertram. Loading dies are available from RCBS. merci Edouard de penser au potos! avant avec deux JO, un 348w et un 8x50 lebel et depuis peu avec un JO CH4D que j'ai trouvé d'occase. ce qui coince, c'est que je n'ai pas de shell holder qui convient pour tenir mes douilles ni le JO en 7,62x54r. mais tout s'accelére,une solution est en cours, comme je ne veux pas tout faire foirer, je n'en dit pas plus, je vous tiens au jus. Cyrille tu n'as pas besoin de jeu d'outil en 7,62X54R quand au shell holder celui du 45X70Winch fait l'affaire et ta solution Naturabuy j'y crois pas de trop a moins que celui qui t'a tirer ton jeu d'outil veuille te le revendre sur ce site. T'embête pas Edouard, je lui ai déjà proposé ta solution, mais l'est tétu l'Cyrille! C'est qui veut son JO!